"Dr. Patrick Baraf is a French surgeon in Plastic, Reconstructive and Aesthetic Surgery. He performs all cosmetic surgery procedures, especially facial facelifts and blepharoplasties (eyelids), breast surgery and abdominoplasty. For more than twenty years, he has been at the forefront of discipline in many fields, which he has helped to develop. He has worked on some innovative techniques such as gluteal implants. He is also specialized in the treatment of inguinal hernias by the Canadian method of Shouldice realized in ambulatory. 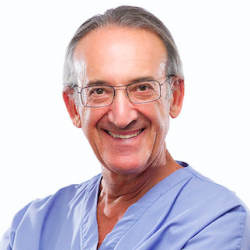 During numerous trips to the United States, Dr. Patrick Barah took part in the development of new techniques in France like Injectable collagen, Liposuction, Photopolymerizable resins (used in cosmetic dentistry), Canadian treatment strategy for Inguinal Hernias, Radiation keratotomy (cure of myopia), Obagi Peeling and others. Founder of one of the first "Ambulatory Surgical Center"